As cute as a button, yet boasting a bite that can send you to an early grave, few things are more recognizable to the gamer than the Goomba from Super Mario Bros. For those among us who’ve experienced the joys of owning a Nintendo console, stomping on and getting killed by this iconic creature is an indelible part of our childhood. It’s therefore no surprise that bootleggers would want to cash in on the Goomba’s nostalgic and sentimental value. For every licensed manufacturer of Super Mario Bros. items, there are a dozen more illegally producing their own poorly made renditions of beloved characters such as the Goomba. 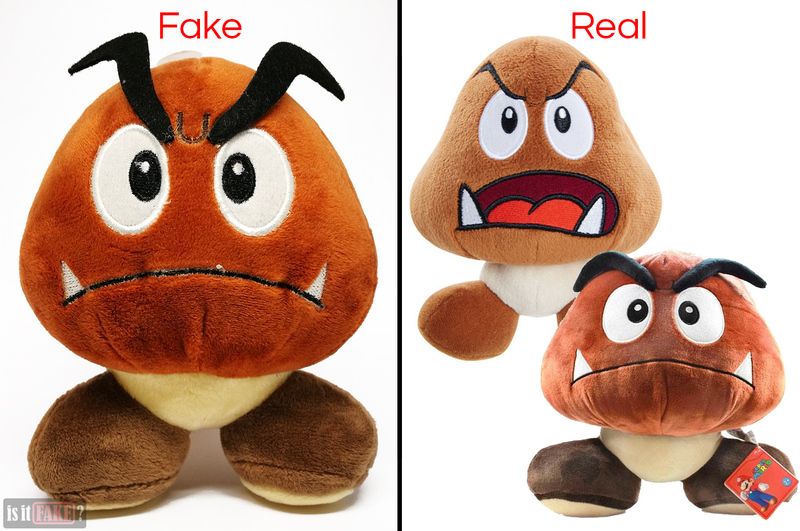 For that reason, we think it’s necessary to prove why buying a counterfeit Goomba is a terrible idea. We’ll even tell you where to get official Super Marios Bros. products… so read on! Because it bears repeating, we’ll say it again: Chinese online marketplaces are notorious for bootlegs. Sellers of fakes are a dime a dozen on DHGate, AliExpress, and the like, so unless you’re willing to risk parting with your money for an inferior product, stay as far away from these sites as you can. 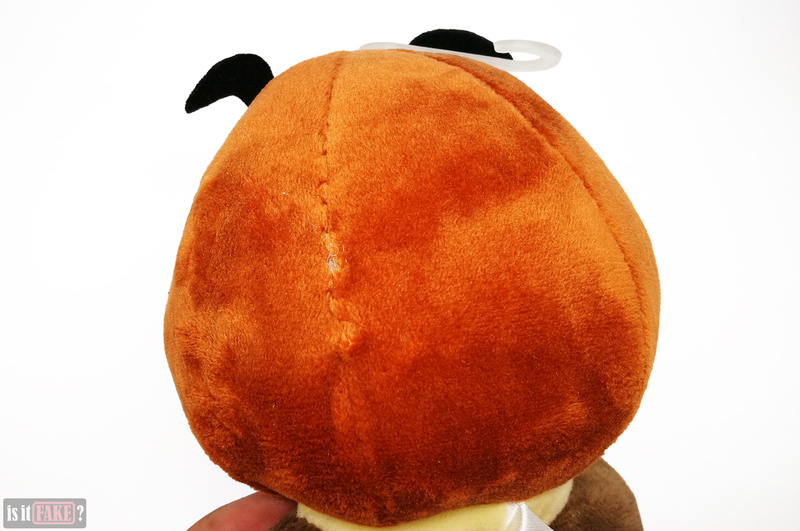 It was from DHGate that we obtained our fake Goomba plushie. Its store page didn’t mention its manufacturer; it’s possible since the Goomba is such an iconic Nintendo mainstay, the seller expected buyers to assume the item one produced by Nintendo. But a product’s recognizability alone doesn’t make it legit, as you’ll find out soon enough. The Goomba is the simplest of designs – it’s essentially a mushroom with feet. If you think there’d be no way to mess up a plush doll based on the creature, however, you’d be wrong. 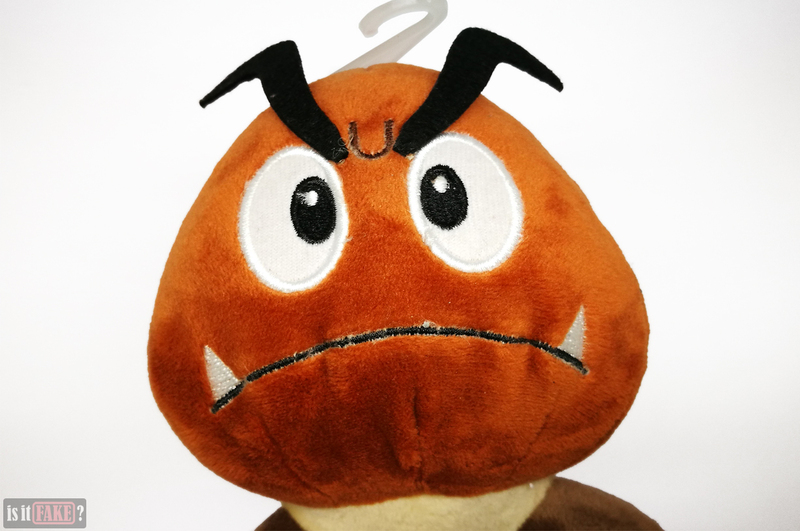 This fake Goomba is around 13cm tall and 10cm wide. While the bootleggers got the shape and main features of the creature right, there are far too many problems with it to make it a worthwhile purchase. Simply put, the stitching is a mess. As you can see from the close-ups, there’s excess thread sticking out everywhere. A clean black line would’ve sufficed for the mouth, but the white fiber running along its edges makes its look like the Goomba has a million uneven, tiny teeth in addition to its two large tusks. Needless to say, it’s an ugly look. The stitching on the eyes is sloppy. You’ll find white streaks on what should be pure black irises, while the eyeballs themselves have fuzzy borders that almost give the Goomba a drugged look. There are clumps of fabric jutting out, with a particularly noticeable one protruding from the corner of its left eye. You’ve probably already noticed the hideous, extra-long ribbons of thread sticking out of the fleshy folds between its eyebrows. Speaking of the eyebrows, they’re equally dirty. They’re made of a flimsy material that’s delicately attached to the Goomba’s skull. With a few tugs, you could rip them off, easily. The seams on the back are just as tacky. 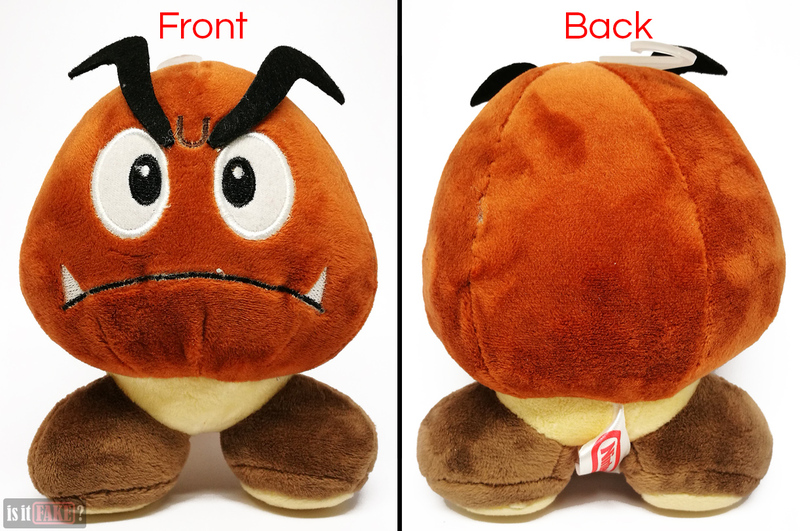 There’s a specific spot left of the middle where a nest of cords seems to be bursting out of the Goomba’s head. The feet haven’t been spared of this clumsy stitchwork. 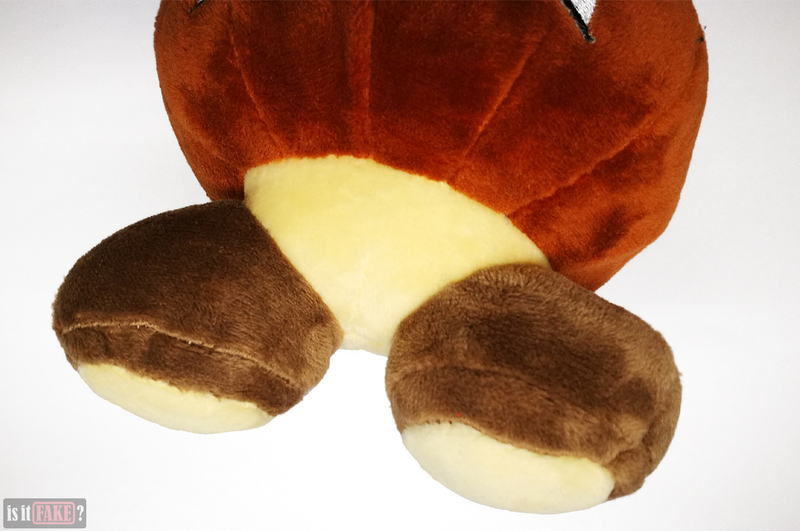 Whoever sewed this travesty of a plush doll botched the outline of the left sole, so that there’s a smaller tuft of beige fur that’s separate from the rest. 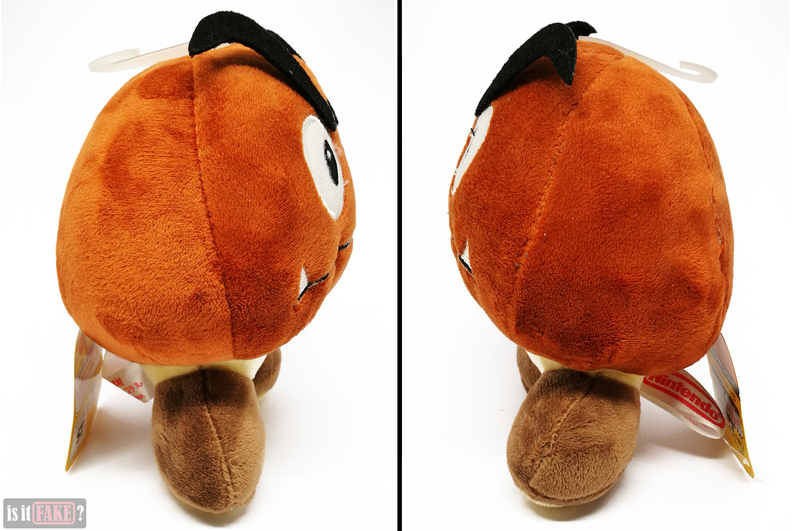 The fake Goomba also has trouble standing; its feet are too narrow, and its soles are rounded. 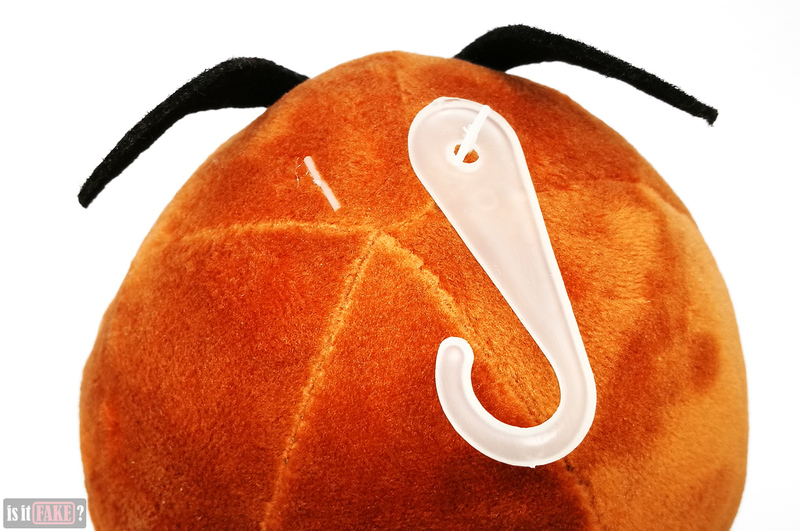 The plush toy comes with a tag and an official-looking card. On the back of the white tag, the Japanese text says the product is made of polyester. 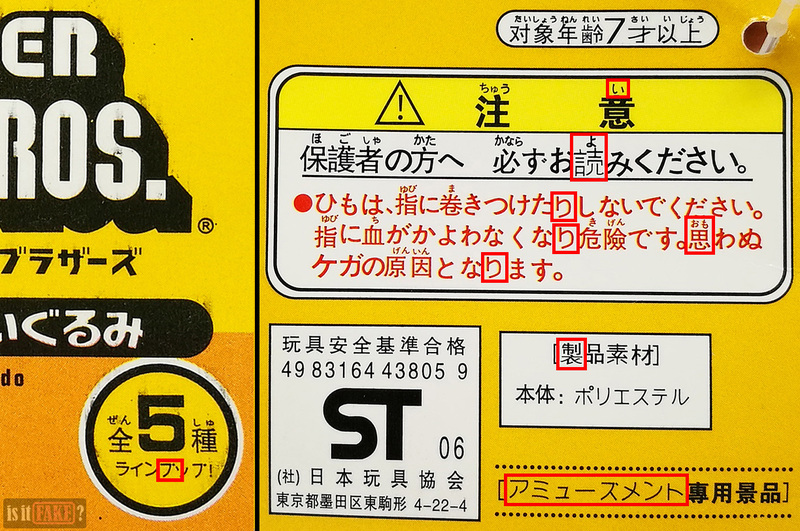 Most of the text on the yellow card is Japanese, but there are a number of Chinese characters mixed in. Some of the hiragana is strange, too, with the font sometimes being thinner or thicker, and sometimes just plain wrong. As for the kanji, they’re all Chinese versions of the characters. We’ve highlighted all the questionable characters in red above. At any rate, the writing is legible for the most part. 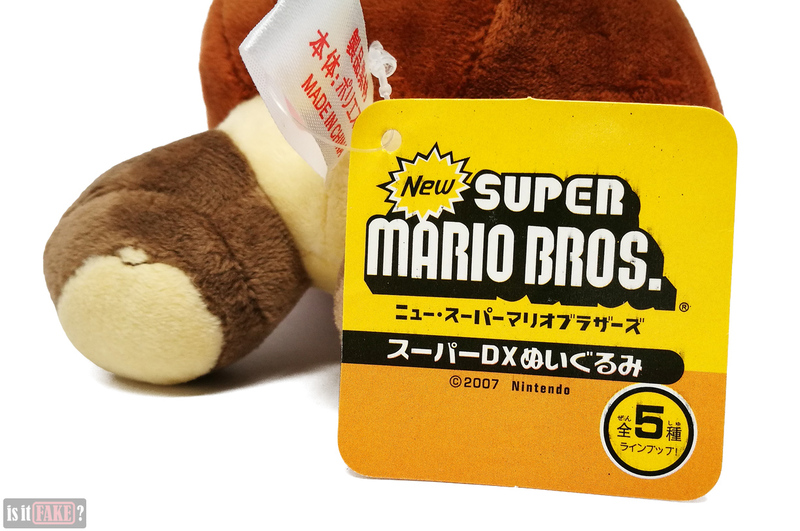 The Japanese text on the yellow tag’s front side identifies the item as a “Super DX plush” doll based on the 2006 New Super Mario Bros. version of the Goomba. 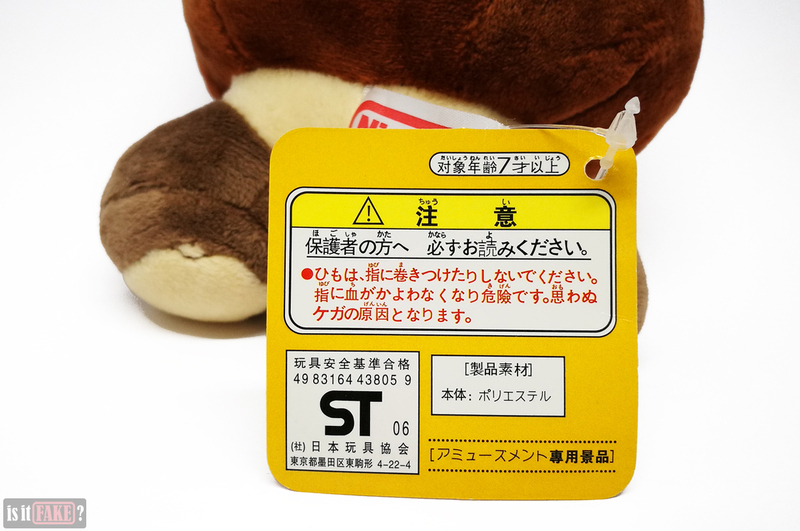 The uppermost text on the back of the yellow tag says the doll is good for children aged 7 and up. The middle text in the large white box is a warning to parents and/or guardians about the plastic string attaching the tag to the doll. This string, if coiled tight around the fingers, can cause injury. The smaller white box below identifies the product’s material as polyester. The text below that states the Goomba is a gift item. The white box with the ST logo is a common indicator that the item conforms with the standards established by the toy industry. It appears while parts of this yellow tag are fake, some were taken from an official product’s. This is a shrewd and calculating move on the part of the bootleggers, as it makes their product look legit to those who can’t tell the difference between Japanese and Chinese writing. 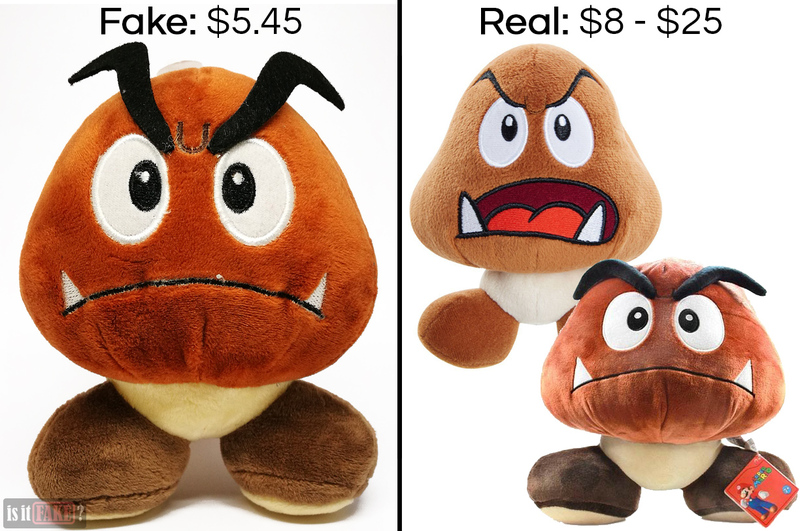 When taken together, this Goomba’s shoddy stitchwork, suspiciously cheap price, and the store from where it was purchased give away its nature as a bootleg. 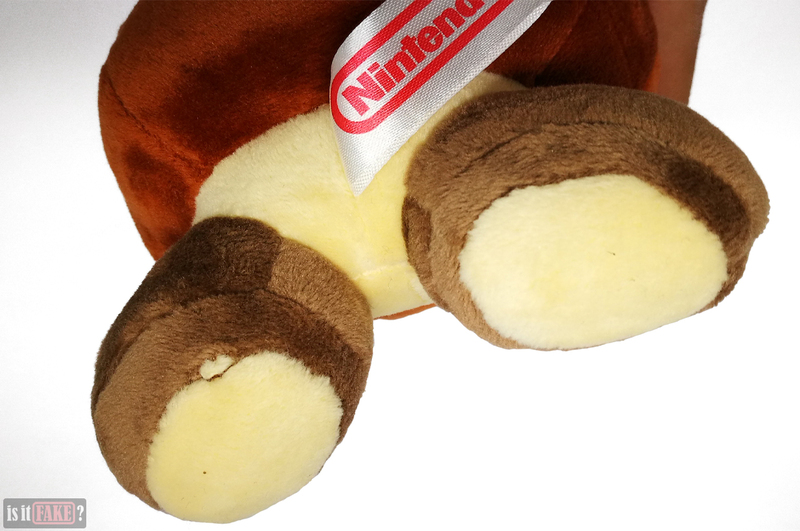 Nintendo prides itself in the quality of its products; neither Nintendo nor the licensed manufacturers of Nintendo products would therefore release a plush doll with such substandard stitchwork. You’d also expect its price to be consistent with its quality. Lastly, if the product is legit, it’d probably be available in trustworthy stores – maybe Nintendo’s own websites would even provide a link to it. Fortunately for Super Mario Bros. fans, there’s a surplus of plush dolls based on the property, and most of them are affordable. 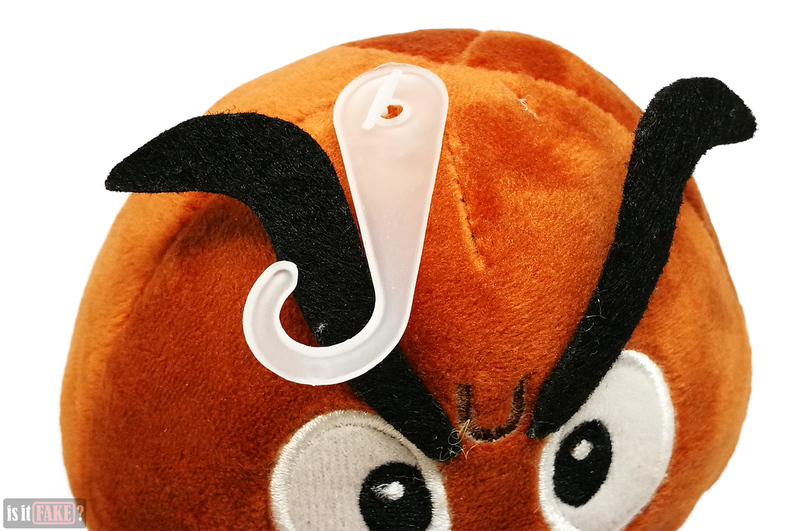 They’re also miles above the fake Goomba in terms of quality, so you won’t have to worry about coils of thread sticking out in the most unexpected places. You can purchase products directly from many of Nintendo’s official stores. Unfortunately, they currently have no Goomba plushies. It might be a good idea to keep coming back to check, though; with the release of the Super Mario Odyssey looming over the horizon, there are bound to be lots of new products soon to be available in the online store. 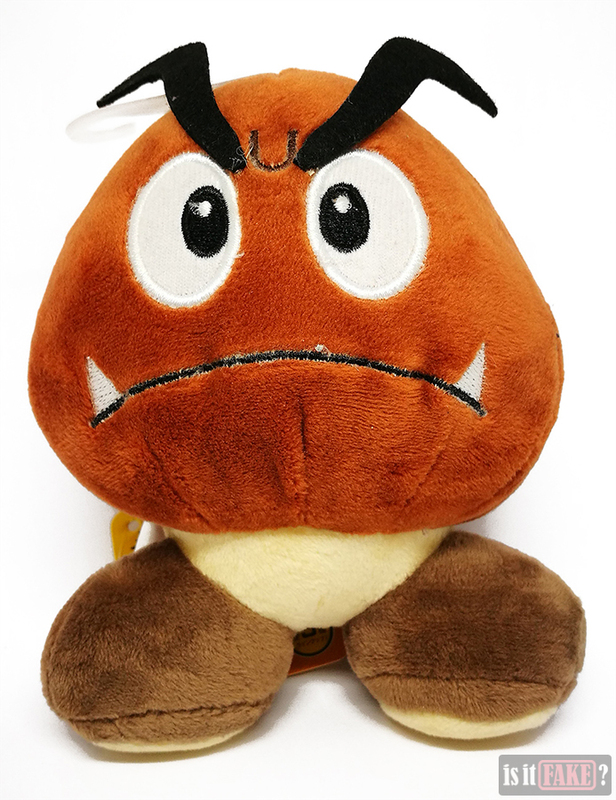 The Australian and New Zealand Nintendo stores also provide links to online retailers where you can buy Nintendo’s 5-inch and 6-inch Goomba plush toys. Click here and here for ZiNG Pop Culture, and here and here for EB Games. The items are pictured below. Click here for a list of other Nintendo-approved retailers! 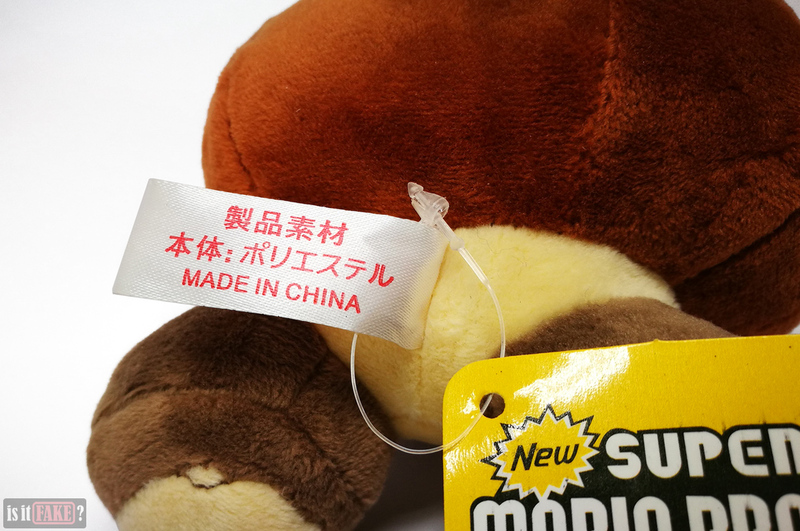 In addition to Nintendo, two major manufacturers/distributors of Nintendo plush dolls are San-Ei and Little Buddy Toys. 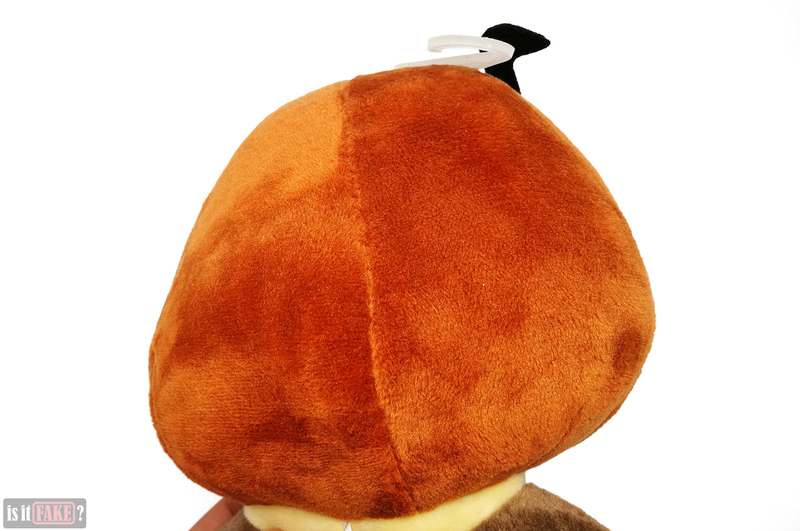 San-Ei and Little Buddy Toys have Goomba plushies, but you can’t buy them from their sites. Fortunately, they are available on Amazon. Just go here, here, here, here, and here. The items are pictured below. Here’s a tip: when buying items on Amazon, make sure you only buy those that are sold and shipped by Amazon itself. This will ensure the item you get is legit. While many third-party sellers also sell officially licensed products, a small number peddles fakes. So unless you’re willing to do extensive research to prove a seller is 100% legit, stick with Amazon. 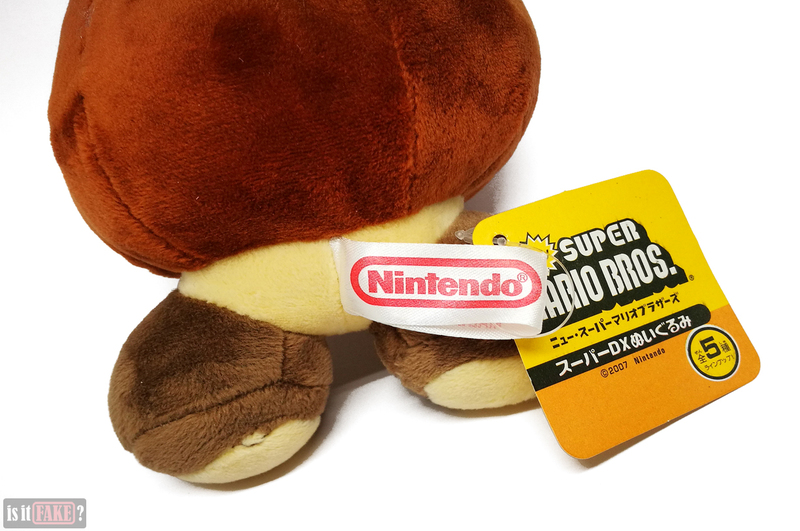 This seal ensures the Super Mario Bros. item is an official Nintendo licensed product. 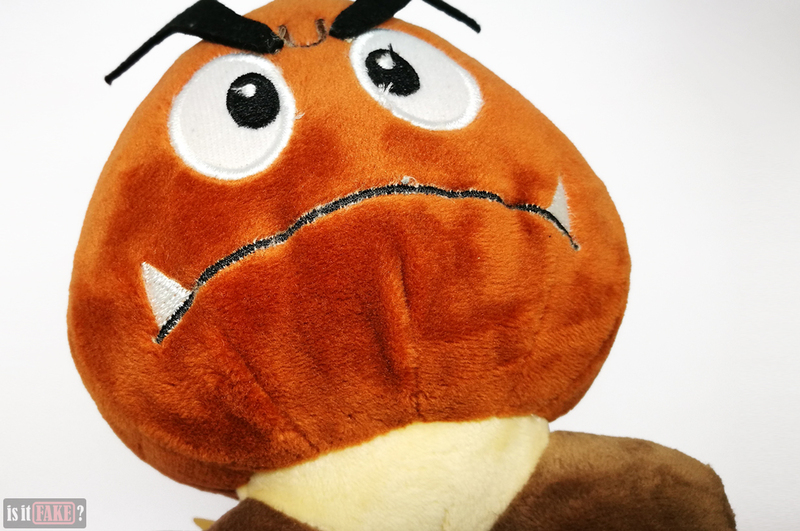 As gamers ourselves, we expect much from plush dolls based on properties as beloved as Super Mario Bros – so you can imagine our chagrin when this fake Goomba, with its subpar quality, landed on our laps. We’re slapping a 60% terrible rating on its ugly face.